Epikgo Classic Hoverboard Review - An All Terrain Hoverboard For The Future? Epikgo Classic Hoverboard Review – An All Terrain Hoverboard For The Future? Hoverboards have traditionally only been suitable for riding on flat, smooth ground such as pavement due to their small 6.5 inch solid rubber wheels. 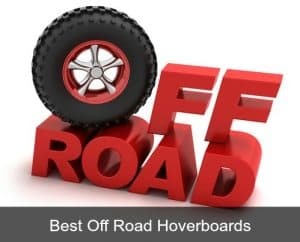 The new generation of hoverboards for 2017 and beyond have some new features that make them more versatile in how they are used, however there are still only very few that can boast of being suitable for off road, and all terrain. The Epikgo hoverboard is one of them. The Epikgo self balancing scooter is new to the market and currently one of the most advanced personal transportation devices available. Lots of common problems that were experienced with the previous generations of hoverboards have all been addressed and eliminated by the EPIKGO. In fact, it is more powerful and robust, larger, sturdier and is said to be one of the safest boards available today. This scooters USP is that it can take you across any terrain (most are only suitable for use on level pavement), and at an impressive top speed of 10 miles per hour. It is powered by a UL 2271 certified Samsung battery and manufactured by a US-brand based in the Silicon Valley. If you are looking to own a sturdy reliable scooter read our Epikgo hoverboard review to see if this is one for your wishlist! 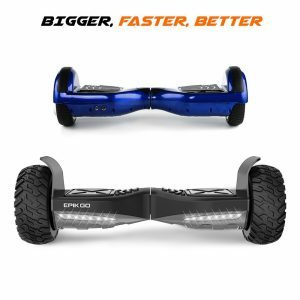 2 How do you use the Epikgo hoverboard? 3 This hoverboard WON’T going going on fire! 4 What makes the device different to its competitors? 8 Where to buy Epikgo Classic board? At first, glance, what immediately strikes you is the size of this hoverboard. Most traditional hoverboards have 6.5 inch wheels, but with 8.5 inch wheels this is significantly bigger. And of course bigger usually means more power! It weighs fourteen kilograms and measures 27.5 by 8.7 by 9.1 inches. It comes with 400w dual motors, which potentially makes its two huge wheels extremely powerful during a ride on rough surfaces. The max load is a whopping 240 lbs weight. The availability of the gyroscopic motor makes it adjust effortlessly to the simple motion of your weight, offering a flawless riding experience. The body is designed with aluminum alloy frame, a feature which provides you with much needed durability. The scooter is 2x more powerful and 30% larger than its leading competitor, providing an increased foot space, a stable ride and more control. Epikgo board speed runs up to 10 miles per hour, an impressive speed for any scooter enthusiast. That’s also faster than other popular boards like the Swagtron and Razor Hovertrax (which only reach 8mph). All terrain capability is still pretty new to hoverboards and the Epikgo hoverboard is one of the first to provide this. The design of this scooter lets you travel quickly over sand, grass, dirt, gravel, and puddles (it’s even waterproof!). 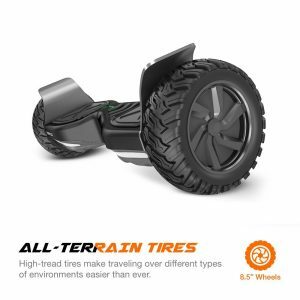 The solid eight and a half inch rubber tires have incredible grip, while the huge wheels coupled with grip allows you to climb over any obstacle with relative ease. Epikgo’s climbing ability is eighteen degrees, but with a bit of speed one could easily get up onto kerbs; something which has been almost unachievable with the smaller self-balancing scooters. Combine these features with its new extra-hard ABS casing, built to offer protection against crashes, then definitely you have a high-quality device at your disposal. First, its new bright and sharp LED provides sufficient light as you ride during night hours, and it has two red lights at the back, aimed at making you visible to other road users. Of course, it is important to note that the inventor incorporated Lithium-ion 4.4Ah powerful battery into the Epikgo, making it quite easy to use. The battery’s charging duration is only one to two hours, a factor that adds to the attractiveness of this scooter. You also enjoy the peace of mind when riding, considering that the scooter has a UL 2272 certification, which guarantees a safe ride without the risks of either short circuiting or overheating. It is also IP56 fully waterproof certified, implying that it is more resilient than a mini PRO, and can gracefully withstand most forms of physical abuse. How do you use the Epikgo hoverboard? This hoverboard WON’T going going on fire! Regarding the safety certification, it is UL 2272 Certified and comes with UL2271 certified LG Smart Lithium-ion Battery. Also, the device underwent and passed one hundred and fifty-nine tests as far as safety regulations are concerned, meaning that you need not worry about potential incidences of fire hazards. 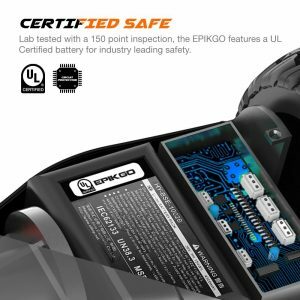 The Epikgo self balancing scooter is also IP54 certified which means that it is water resistant. That doesn’t mean that you want to submerge your scooter under water, however it’s safe to use in rain, travel through puddles etc. What makes the device different to its competitors? The all-terrain capability: It can ride on various types of landscapes, and successfully maneuvers through mud, grass and sand. Few other scooters out there can offer this kind of functionality (yet). Most are only designed to use on flat ground like pavement. More powerful motors: The dual 400W motors are unique and enable it to climb slopes as steep as eighteen degrees and to last for over one hour at 10 mph top speed on a single charge, hence this is one of the most powerful self-balancing boards available. Bigger and more durable: Bearing in mind that it is thirty percent larger than its leading competitor, it ensures a more controlled and stable ride. The all-terrain ability makes this so much more versatile than its competitors. Sand, gravel, grass and more shouldn’t pose a problem to this beast of a board. This is the main reason most people buy the Epikgo, because there are no other hoverboards that can travel quite like this. The sturdy design makes for a more stable ride. Bigger wheels also make for a smoother and more stable ride. More powerful motors mean higher speed and are necessary for dealing with rougher terrain. It is fully UL certified (poses no fire risk) and also waterproof. Currently, as it stands, the Epikgo Classic is nearly flawless. Read Epikgo reviews on Amazon and you’ll see for yourself that customers have nothing but positive feedback about the product so far. The only real “con” that I can think of is that it’s more expensive than others on the market. You get what you pay for though when it comes to quality and functionality. It comes with a one-year warranty, which primarily covers labor and parts from the manufacturer, a US company based in Silicon Valley. You can just inform them about any issue during this particular period, as they are available seven days a week and twenty-four hours a day. This is an ideal option for individuals who want to use their scooters in any environment. Sand, gravel, grass or dirt – the Epikgo hoverboard handles them all admirably. The Epikgo board speed will be a draw for many users as well because it’s one of the fastest boards out there – at least 2mph faster than many of its competitors. 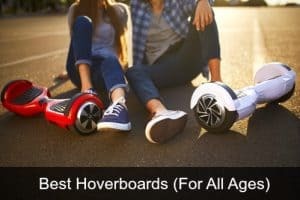 As the Epikgo is bigger and more powerful than the average hoverboard on the market this is probably more suited to teenagers or adults than smaller kids. It IS a little more expensive than other hoverboards on the market, but in terms of its power and capability it doesn’t have any real competitors except maybe the Mini Pro. 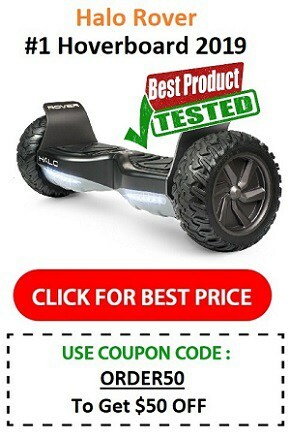 Well worth the investment if you’re looking for an all terrain self balancing scooter and one of the fastest UL 2272 certified hoverboards on the market. Where to buy Epikgo Classic board? It’s currently only available on the official website and on Amazon – I like Amazon for its free shipping, customer service and if you check regularly you can find some good deals there too. Jason Leeman is an engineer, tech geek and personal electric vehicle enthusiast. He loves testing the latest in urban personal transportation and sharing his love of wheels with his kids and his blog readers. Koowheel Hovershoes Review – Insane New Hover Skates For All Ages! Acton Blink S2 Electric Skateboard Review – Is It Worth The Investment? Gotrax Glider Electric Scooter Review – Is It Any Good? 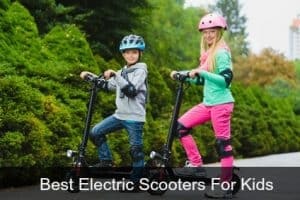 Bestelectricrides.com is a participant in the Amazon Services LLC Associates Program, an affiliate advertising program designed to provide a means for sites to earn advertising fees by advertising and linking to Amazon.com.